For one week in August London-based artist Dafna Talmor decamps to the seaside to transform the tiny wooden room of The Old Lookout Gallery in Broadstairs, Kent into a gallery-sized camera obscura, photo-studio and darkroom. Embracing the challenge of a residency open to the public Talmor invites visitors to play an integral role in the image-making process. Participants will find themselves acting as both viewer and view-ed, becoming both the subject of the photographic seascapes produced and collaborators in their development. For the artist, See View, contributes to an ongoing investigation into people’s investment both physically and psychologically in the spaces they inhabit or move through. Located in the 18th Century old Harbour Master’s building, See View experiments with the model of a camera obscura (appropriately as low-tech as the building itself) to offer audiences an introduction to the workings of the photographic process. Visitors will enter the blacked-out space of the gallery to find the windows and the expansive sea view blocked. Instead, the view is projected into the room via a lens and captured as image on photographic paper. Invited to admire these projected views, visitors move between the lens and the paper, experimenting with their own forms as they find themselves becoming part of the image. As a record of their presence in the photographic chamber, audiences leave behind a silhouette against the captured seascapes. The figures literally obstruct the landscape, both present and absent in their blanked-out forms. As the obstructed seascapes lose their detail they assume the quality of a fictionalised view reflecting back the human presence. Large-scale photographs will be produced throughout the days reflecting the changes in tide and light outside the windows. Engaging with the seaside location, Talmor hopes to incorporate natural objects from the surrounding area into the images produced, including the spectacular local seaweed. Holiday-makers in the Harbour may well see the artist using sea water to wash the newly developed prints hanging in the open air. 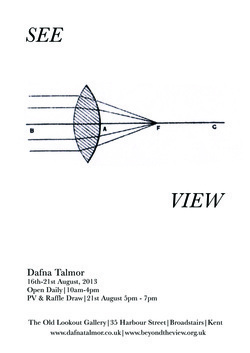 A one-day exhibition of the photographic works, with closing-view, will conclude Talmor’s residency. Dafna Talmor is a visual artist based in London. Talmor completed her BA Fine Art at Goldsmiths (2001) and MA Fine Art Photography at the Royal College of Art (2004), London and has been exhibiting her work nationally and internationally since 1999. Talmor’s photographs are included in private and public collections such as Deutsche Bank and Hiscox and have been featured in publications such as ArtReview, Camera Austria, Hotshoe, the recent winter issue of Elephant (13) and is currently featured online on GUP and UYW. In 2005 she was nominated for the Paul Hamlyn Artist Award, received the IV Daniela Chappard Biennale Photography Award in 2007 and in 2013 the Photofusion Select Bursary Award, an Arts Council England Grants for the Arts Award and selected for the Renaissance Photography Prize 2013 as a series finalist. Alongside her art practice, Talmor lectures and runs workshops in different contexts under Cameraworks, an initiative she co-founded in 2007. In 2008, she set up and currently runs a shared studio with darkroom facilities in partnership in London and co-curated and participated in TestBed 1, an ambitious series of artist residencies and events culminating in an exhibition at Beaconsfield in 2010. In March 2014 she will be presenting On Landscape, a group show and series of events co-curated with Minna Kantonen and Emma Weislander, in Yinka Shonibare's Guest Projects in London. Special thanks to Michael Shaw, Joe Brown, Sam Vale, Minna Kantonen, Lily Davies, Jason Tasker at Metro Imaging, Bryan O’Leary at Artful Dodgers, Michelle Parr at Ilford Photo, Felix Friedmann, Rebecca Strickson, Patrick Thursby, Nigel Breadman, Dr Karen Shepherdson and everyone that bought raffle tickets.